SMYRNA, Tenn. (Bloomberg) -- Nissan Motor Co. began building a battery factory next to its main North American auto-assembly plant to support CEO Carlos Ghosn's expectation of surging U.S. demand for electric vehicles. By the time it opens in 2012, the Smyrna factory will be able to supply lithium-ion battery packs for 200,000 electric cars annually, topping Nissan's plan to build as many as 150,000 rechargeable Leaf hatchbacks a year in Smyrna. Japan's third-largest carmaker said today its $1.7 billion investment in battery and Leaf assembly capacity in Smyrna, funded mainly by a $1.4 billion U.S. government loan, will add as many as 1,300 jobs in Tennessee. 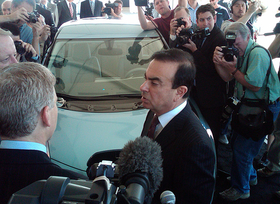 Ghosn, 56, has set a goal for Nissan and partner Renault SA, which he also runs, to lead an emerging market for electric autos as the U.S., Japan and Europe push automakers to cut carbon emissions tied to global warming and oil consumption. While General Motors Co., Toyota Motor Corp. and other competitors are readying their own rechargeable models, none has set volume goals matching Ghosn's intention to sell as many as 500,000 electric cars a year by 2012. “We understand that when you go into innovation or new technology, some people are more bullish and some are more bearish,” Ghosn said yesterday during an event at the Detroit Economic Club. GM aims to build 45,000 of its Volt plug-in cars, which also use gasoline, annually by 2012. Toyota hasn't set volume targets for either its plug-in Prius hybrid or “urban commuter” minicar that arrive in the U.S. in 2012. “Frankly, sales of 500,000 vehicles by 2012 is just wildly optimistic,” said KG Duleep, a Washington-based analyst for ICF International who helps the National Academy of Science and U.S. agencies with advanced automotive technology. President Barack Obama has set a goal of getting 1 million plug-in and battery vehicles on U.S. roads by 2015. Ford Motor Co. on May 24 said it's investing $135 million and adding 220 jobs at three Michigan facilities to help it introduce five models powered wholly or in part by electricity by 2012. The first shipments of Nissan's Leaf, capable of traveling as far as 100 miles solely on battery power, will arrive late this year in Japan and the U.S. Nissan has said it expects U.S. tax credits and rising fuel prices to spur demand for the $32,780 car, which will cost $25,280 after U.S. subsidies. Nissan last year was awarded an Energy Department loan of as much as $1.6 billion for “advanced technology” vehicle production in the U.S. The company has since modified its loan application, finding “system efficiencies” and trimming the requested amount to $1.4 billion, said Katherine Zachary, a Nissan spokeswoman.